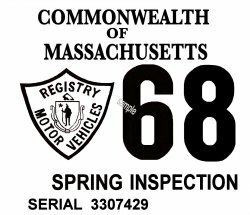 1968 Massachusetts SPRING INSPECTION Sticker - $20.00 : Bob Hoyts Classic Inspection Stickers, Add a Final Touch to your Restoration! This is a 1968 Massachusetts SPRING INSPECTION Sticker. They were issued from April to October, 1968. It has been carefully restored and reproduced, front and back with high quality paper with our patented "Peel and Stick" format which allows attaching to the inside drivers side of the windshield. For an additional $10.00 you can order your own License plate number we'll add to the front of this sticker in place of the serial number. NOTE: This is NOT the only sticker you need to make your classic 1968 car correct. In 1968 there were no license plates issued , and a registration sticker was required to validate the license plate issued in 1967 and show that the car was legally registered in 1968, See our REGISTRATION STICKER for 1968.